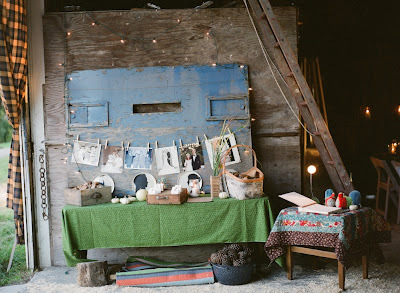 Last week, for the Pinisher theme "Adventures" I featured my daughter's barn wedding reception, specifically how we decorated the barn entrance. This week the Pinisher theme is "Family" and, sure enough, I can fit the wedding into that theme too. Dorian, the inventer of the Pinisher link-up says in her host post that we are free to post about "things we did a few weeks ago." Let's see: it's been 85 weeks since the wedding. I say it's close enough. Seems just like yesterday! We decided to do our own rustic version. 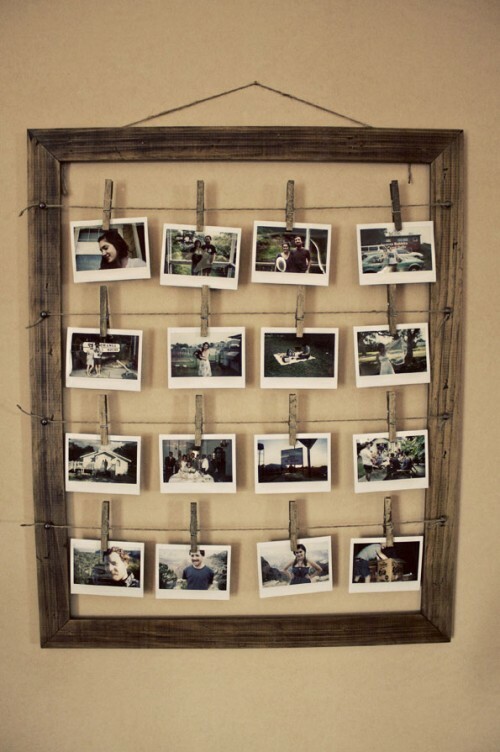 The situation was looking a little dire, but I finally was able to fish out the photos and hand them off to my nephew who tore down the lane to the barn in our rented golf cart and hung them just as I had ordered asked. Didn't he do a great job? Everyone loved seeing the family weddings pinned up at the entrance to the reception. For more "family" pinterest fun, head over to Dorian's Pinisher link-up. 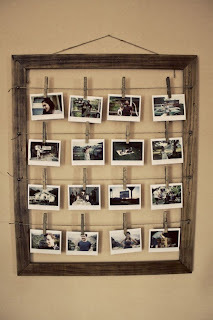 This week's theme for the Pinisher link-up is "Adventures" and my greatest Pinterest adventure was the reason I joined Pinterest in the first place. Back in 2010 my daughter was newly engaged and my specific purpose in signing up for Pinterest was to get ideas for the wedding. The young couple wanted to hold their wedding reception on a farm. Did I talk sense into them? No, I actually thought it was a cool idea. While I'd never yearned to make all the things for a wedding that's pretty much what ended up happening. 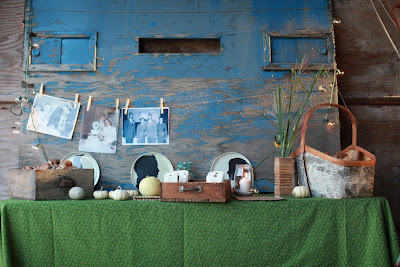 Our barn reception turned out to be a major exercise in Do It Yourself. 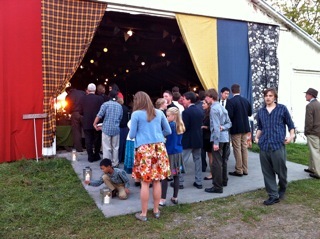 There had never been a reception in this working barn, and we had to figure it out from scratch. Luckily we had lots of help from friends and family when it came to set-up week. In the early planning stages I started a Pinterest Board imaginatively titled "barn reception" and it soon filled with lots of rustic ideas. 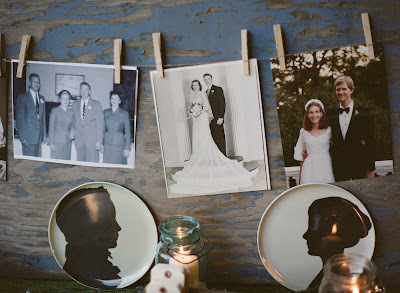 In fact almost everything that we did for the reception was inspired by Pinterest finds, and I could (and might) fill many many posts with reports of the various barn wedding-y projects. 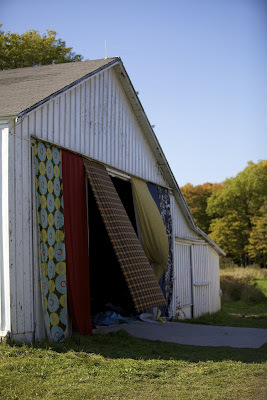 Today's post will show how we spruced up the barn entrance. 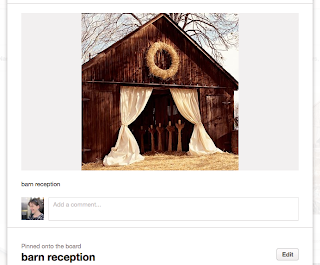 Seriously, if you go to Pinterest and search "barn reception" you will find scads of barns with white gauzy curtains in the doorway (for example here, here, and here), with or without a big wreath somewhere on the barn. I think the photo above is the original and subsequently oft-copied barn + curtain + wreath combination (but the pin doesn't go anywhere except to an image file). 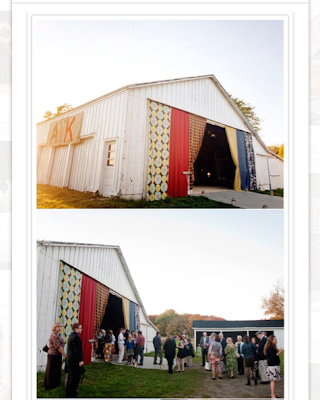 As cool as that Pinterest barn looked, white curtains weren't going to work for us because (1) our barn was white and boring and (2) the bride wanted COLOR and PATTERN. How did we execute the curtain idea? We (and by "we" I mean the groom and his friends) attached the fabric to the top of the doorway with a staple gun and a ladder. Go check out more Pinished Adventures on Dorian's round-up post. If you want to join (and you should!) the upcoming themes are here. A few years ago my cousin and her husband bought a new house. Three days after the moving van dropped off all of their earthly belongings, they had a completed picture-perfect house: furniture positioned, drapes at the windows, every picture hung. And although we must have some DNA in common, seeing as we're related, I definitely don't share her "finished house" gene. 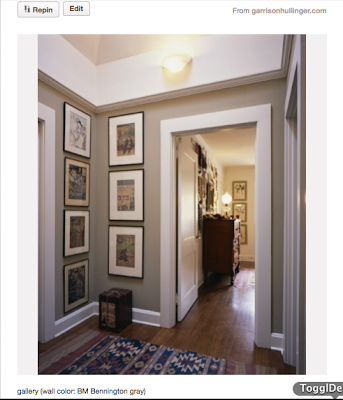 I'm amazed at how much more complete the room looks, just by adding six pictures. I mean, you almost don't notice that our end table is an old wooden packing crate, right? These pictures make a good group because they are all drawings (well, one's a collage) of our family (and our house) and they're all fairly neutral. 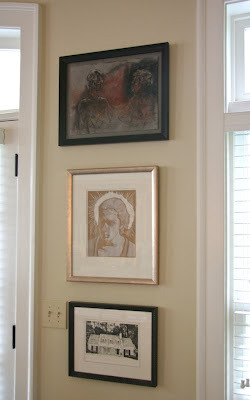 Two were done by my daughter and one by my husband, so I wanted them to be in a prominent spot. 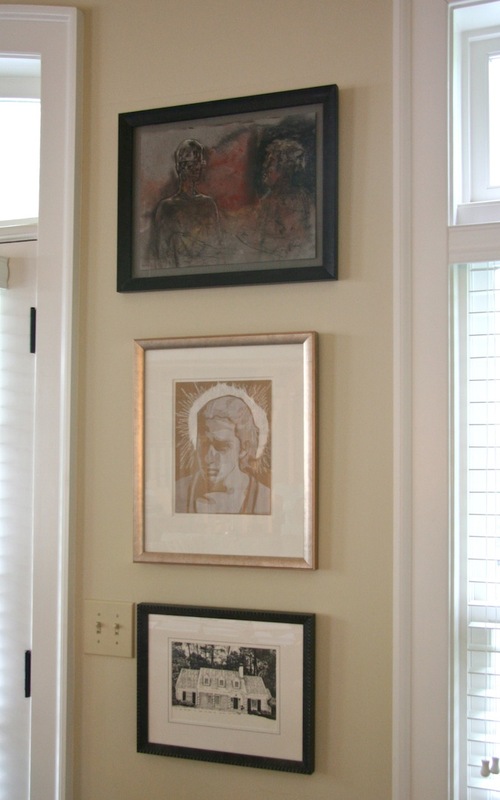 The wall is my view from the kitchen sink, and seeing all the drawings hanging together makes me smile. I'm glad I finally pinished this project! 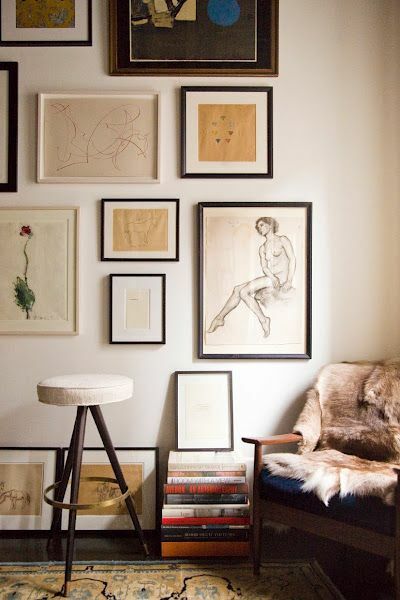 Head over to Dorian's post to see what home-y things the other Pinishers were up to this week. In case there are any long-time readers out there, I know it's been nearly a year since I've posted on this blog. Although I have not been photographing or posting my food lately, my adventures in the kitchen have not stopped. There are tempting recipes to be tried - always! - and now, more and more, I've been finding intriguing recipes through social media. One site (service? obsession?) I've enjoyed has been Pinterest. Maybe you've tried it too? It's borderline-addictive to explore food (and crafts, and quotes, and decorating ideas, and organizational tips) that others have "pinned." 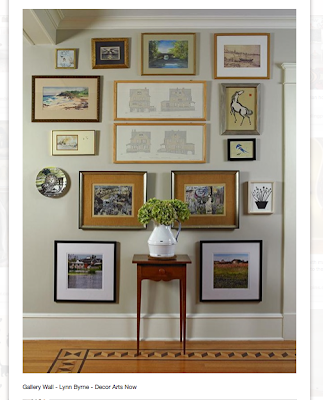 And it's useful for me to save great ideas by "pinning" as I find them on my internet forays. One thing that happens with my pins is that they tend to stay pinned - they sit on my pin boards looking beautiful, but that's often as far as it goes. 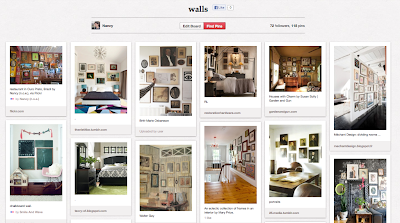 To date I've pinned 4,175 things. As for finished projects from those pins? Um, just a handful. To remedy this common (as it turns out) situation and get us all trying - and finishing - some of the things that we pin, my internet buddy Dorian has started a roundup for finished pins, pin finishers, or "pinishers" as she calls them/us. This week's Pinisher roundup theme is "food" (her list of weekly themes here) and I have a pinished product to share, and to link up with the other Pinishers! I found this spring salad recipe in a link tweeted by Whole Foods about a month ago. I pinned it immediately. And then, wonder of wonders, I actually made it the same week. And every week since then. - The recipe for spring salad on Whole Foods' website. My pin for the salad is here. - This salad is a snap to put together. I shaved the raw asparagus with a vegetable peeler, and I mixed the salad dressing with an immersion blender. - I have found it easier - and more attractive - to toss just the greens with the dressing in a large bowl and then portion them onto individual salad plates. Then I top the greens with the asparagus and then the strawberries, spooning a little more dressing over it all. I am so glad I pinned and tried this recipe; it will be at the top of my rotation, especially for springtime dinners. It's perfect for entertaining because it can be prepped ahead of time and assembled quickly before serving. And it's as delicious as it is pretty. I'm linking to Dorian's Pinisher roundup: The Pinishers, volume 1, Food - head over there to see the different pinished products, and join in yourself any week. Today, July 15, is my blog's 4th birthday - time for cake! In his book The Modern Baker, Nick Malgieri has a recipe he calls the "Perfect Birthday Cake" - yellow cake with chocolate frosting. 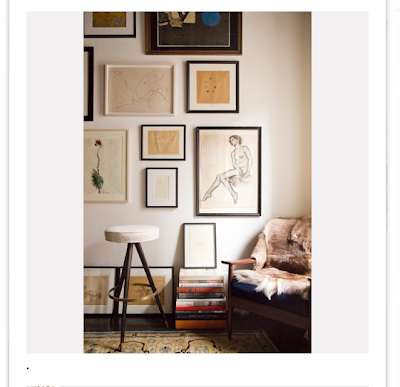 That just so happens to be my favorite combination, a perfect way to celebrate my blogoversary. - Some talented and dedicated bakers have been baking their way through Nick Malgieri's book as part of an effort called the Modern Baker Challenge. I have, on rare occasions, joined them. This post is my contribution to the cake section of the Challenge. I started this blog in response to a different baking challenge - weekly baking of every recipe in Dorie Greenspan and her book, Baking From My Home to Yours with the original Tuesdays With Dorie group. The Modern Baker Challenge has given me a fun opportunity to dip, however sporadically, into another baking challenge. The Modern Bakers do not post the recipes, so if you'd like to bake this cake, you'll have to find a copy of the book! It has come out in paperback, so you can pick it up for a reasonable price. - Although I'm posting this cake in honor of my 4th blogoversary, I actually baked it for my book group's 6th anniversary. Hence the "6" candle you can see in the picture below. - I baked 1/2 recipe in my 6" cake pans. I ended up with layers that were quite petite. - Because there was so little batter in the small pans, the cake baked very quickly. In fact, I probably over-baked it by just the tiniest bit, which was totally annoying. - The cake layers had firm structure and a fine, close crumb. There were some mysterious "swiss cheese" type holes in the cake but I have no idea why they were there. - You can see from the frosting how my layers weren't totally level. I didn't want to trim them because the layers were already so small. So I just turned the top layer upside down, leaving a flat top and bottom, but a sizeable gap in the side, which I filled with frosting. - Nick's Perfect Birthday Cake combines yellow layers with a fudgy ganache frosting. I was very surprised by this cake. It could not have been more different from the standard yellow box cakes of my previous baking life. The layers were improbably soft and tender, despite a possible minute too long in oven. The cake was light but not dense, dry but not sawdusty. The intense ganache frosting was a perfect complement. It took me until my second slice to figure out that I loved the cake! It's funny: I've been baking recipes from Dorie for 4 years, but I can still get nervous butterflies when I look at a recipe. Just thinking about today's recipe, the Peppermint Cream Puff Ring, filled me with trepidation. The pastry is the classic French pâte à choux, and for the recipe to be successful, the dough needs to puff as it bakes, so that there's a nice hollow place for the cream filling. You don't know until you finish baking whether you have a puff or a pancake! I didn't have any need for a whole pastry ring this week, so I cut the recipe way back and made Cream Puffs. In fact the ingredient volume was so small that I was able to use the little 1-cup copper saucepan that I bought in Paris. I thought it was fitting to use this pan here at the end of my 4 year baking adventure with Dorie Greenspan and her book, Baking From My Home to Yours. 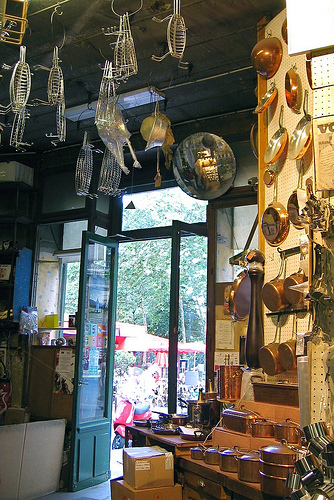 Before I joined the Tuesdays With Dorie baking group I never would have thought to go to a kitchenware store in Paris, but my visit to E. Dehillerin was a highlight of my week in Paris in 2010. I smile every time I use the little pan I bought there. - You can find the recipe for this cream puff ring on the blog post of the original host, A Consuming Passion, here. - I made 1/8 recipe, which was enough dough for 2 small cream puffs. - As they baked, the little dough circles puffed a bit in the oven. As they cooled they collapsed, but they were hollow inside. I sliced the top and pulled out the bits of soft dough, as Dorie instructs. - I knew that I didn't want to use the peppermint cream from the original recipe - too reminiscent of toothpaste to me! As I thought about other possible flavors, I remembered that I had leftover grapefruit cream in the freezer from this pie back in February, so I thawed it out and filled the cream puffs with that. Dorie pipes her cream in beautiful rosettes, but I skipped that fiddly step and spooned the cream on the bottom of the puff and popped on the top. - I whipped up a few spoonfuls of ganache in the microwave, using 1 ounce of chopped chocolate and 1/4 ounce of heavy cream. The cream puffs were good - I liked the grapefruit and chocolate combination. But even more than the taste, it was gratifying to tackle a classic recipe - and end up with a decent result. It's gratifying that Dorie's book has kept me learning even up to the very end of this project (I have one more recipe to post, and then I will be finished with the book!) And while I'm not comfortable with every single technique, I know that by now I've tried nearly every baking method that's out there. Until I began baking with the original Tuesdays With Dorie baking group, I'd never made pudding from scratch. Box mixes are very easy and tasty enough. In the last few years, however, we TWD bakers have tackled homemade pudding on a couple of occasions: split level (vanilla) pudding, and real butterscotch pudding (not to mention flan, creme brulee, cup custard, pots de creme, and various bread puddings - all of these, plus a few non-Dorie offerings, can be found by clicking on my blog's pudding tag). Dorie has a specific method to her pudding recipes, not difficult by any means, but there are several steps. The ingredients go in and out of a saucepan and a food processor. It might seem just a bit... unnecessary, and I know other bakers have taken shortcuts with Dorie's puddings, and proclaimed the results fine. In the past I've tried it both ways, and I found that following each of the steps produces a smoother, creamier pudding. The recipe for Chocolate Pudding was chosen shortly before I joined Tuesdays With Dorie in July 2008. As I have worked my way through the recipes I missed from Dorie Greenspan's book, Baking From My Home to Yours, I knew that the pudding was coming up and I figured it would be a cinch that I'd like it. This week I got a chance to see. - Dorie has posted the recipe for her chocolate pudding on her own blog. - I was running low on milk, so I used half whole milk and half coconut milk. If you wanted to make it non-dairy (and you like coconut) you could use all coconut milk. - After mixing the ingredients in the food processor, when I poured the liquid back into the saucepan it was quite frothy. It settled a bit as the pudding thickened, and then smoothed out beautifully in its final trip through the food processor. - I could have boosted the coconut flavor by topping my pudding with toasted dried coconut, but I opted for chocolate-covered cocoa nibs instead. This pudding was smooth and rich, the best chocolate pudding imaginable. I liked the little hint of coconut, but I'd love it made with all regular milk also. The pudding would still be delicious if you didn't follow all the food processor steps, but it wouldn't reach the creamy, dreamy perfection that Dorie's method produces. Several months ago, when I was in California, I came across some great strawberries. I snapped them up and immediately baked up Dorie Greenspan's La Palette's Strawberry Tart from Baking From My Home to Yours. The recipe has only three elements: tart crust, strawberry jam, and macerated fresh strawberries, and I knew that each element had to shine. The berries were amazing (so much so that I didn't even macerate), and I know that Dorie's tart crust is perfection. To match the quality of the first two elements, I splurged on some beautiful French strawberry jam. But then in May my MacBook hard drive (just over a year old) went to hard drive heaven and took my strawberry tart photos with it. They were cute photos, too, darn it! I knew I had to re-bake the tarts, and that finally happened this week. The photos are from the new tartlets, which we enjoyed every bit as much as the first ones. - Dorie herself posted the recipe in her column for Serious Eats. - The first time I baked the tart, I used Dorie's tart crust, which I've made many times before, and love! The filling was French strawberry jam, and I used the fresh strawberries by themselves. I didn't add sugar or liquor to them, and forgot the black pepper. - The recipe is interesting because all of the elements are kept separate until the time that the tart is served. When one big tart is made, the shell is sliced, then spread with the jam and the strawberries are piled on top. - I usually find that making mini tarts adversely changes the recipe's proportion of crust to filling but in this case, the tart is assembled after the crust is fully baked, and the jam and berries can be increased or decreased to taste. In fact, the berries are supposed to spill over the crust. The recipe sounds so unassuming, a few simple elements, no big deal, but let me tell you: This was a sleeper of a recipe! We loved these tarts. (Both versions!) The juicy fresh strawberries played off of the sweet strawberry preserves, all in the context of a buttery, almost cookie-like crust. It's a perfect summer make-ahead dessert, and can be varied with whatever berries happen to be in season. In much of the US in recent days the weather has been just a bit warm shall we say? I saw the forecast of the advancing heat wave, and prepared to hunker down: changed the filters in the air conditioning system, dug out shorts and tank tops, and closed the blinds against the strong afternoon sun. And I made ice cream. The Tuesdays With Dorie group choose Blueberry Sour Cream Ice Cream soon after I joined the group in 2008. I didn't have an ice cream maker at the time, so I took and excused absence and baked something different that week. But now that I'm trying to finish every recipe in Dorie Greenspan's book, Baking From My Home to Yours, and with a well-broken-in ice cream maker in its permanent spot on my kitchen counter, this week was the perfect time for me to make that recipe. - You can find the recipe on the post of the original TWD host for this recipe, Chronicles of Culinary Curiosity. - Some lovely local blueberries came in my farm box, so that's what I used for the ice cream. I like that Dorie gives flexibility to add sugar and lemon juice to taste; I added slightly less sugar and a solid dose of lemon juice. I cut the amount of sour cream by a little bit because I didn't want it to mask the blueberry flavor. - After I finished making the ice cream base I gave it a little taste. The blueberry flavor seemed a bit mild and I debated whether to make up more of the cooked, pureed blueberries and add them, but in the end I decided that I'd leave the ice cream as it was, and add some fresh blueberries or blueberry sauce when I served it, if we thought it needed something. I brought this ice cream to dinner with some friends. (I packed it in this container so it wouldn't melt in the 106 degree heat) Everyone finished eating the ice cream, but nobody raved. To me it fell somewhere between "OK" and "not that great," The texture was nice and creamy, the sour cream added just the right amount of tang, but the blueberry flavor was too faint. I think the ice cream could have benefited from a lot more blueberries. My husband agreed, "Something about the blueberries didn't go with the creaminess." It was cold, though, and a beautiful color! Here's a piece of life advice: the next time you make a pie, make the crust you need and then immediately make another batch of pie dough. You've already got the recipe in front of you, the bowls and implements are already dirty, and you will not believe the virtuous feeling you will have when you slip the extra dough into the freezer, knowing that with a bit of work now you are saving yourself a lot of time later. And later? When you look in your freezer and there is a nice disk or two of pie crust, you know that you can have a pie in the oven in a matter of minutes. This week I found myself in just that situation. I had some lovely local blueberries from my farm box order, and with the crust already made, I decided on the spur of the moment to bake Dorie Greenspan's Double Crusted Blueberry Pie. Even though it was late afternoon, I was able to have it on the dinner table in short order. - The original Tuesdays With Dorie host for this recipe in 2008 was Amy of South in your Mouth. You can find the recipe on her blog post. I'm going a bit out of order, but this is a recipe I'm baking in my plan to finish all of the recipes in Dorie Greenspan's book, Baking From My Home to Yours. - I made half of the pie recipe in my little 7" mini metal pie pan. I had actually rolled out and frozen a crust right in the pan. All I needed to do was to fill the pie and roll out the top crust. The crust thawed as I mixed up the filling. 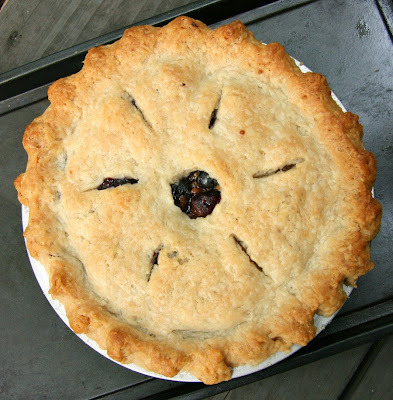 - Sometimes blueberry pies can be runny in the middle from all the juice released by the cooking blueberries. Dorie combats that in two ways: adding a hefty dose of flour to the blueberries, and lining the bottom of the pie crust with dried breadcrumbs. 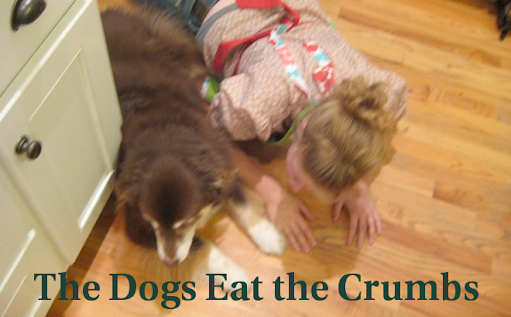 I don't use prepared breadcrumbs, but usually make mine by crumbling and baking fresh bread. I was feeling lazy, though, so I skipped the crumb layer. I added flour to my blueberries, but somehow forgot to add the full amount that I'd measured out. As it turned out, the pie was perfect, not at all runny and also not dry. - The recipe calls for tossing the berries with lemon zest, sugar, flour, salt, and lemon juice. Dorie gives measurements but advises that we add the amounts to taste, which makes sense because blueberries can vary in sweetness. I used a bit less sugar (and I used palm sugar) and a healthy squirt of lemon juice. - So great was my laziness that I also skipped the egg wash on the crust. Luckily my pie turned out nice and golden anyway. I served this pie at a family dinner last evening, and my husband and daughter agreed that it was an exceptionally excellent blueberry pie! The lemon zest and juice added a sparkle and brought out the flavor of the berries. This will be a "go-to" pie in the summer (or even out-of-season with frozen blueberries), especially if I have pie crust in the freezer! Berries are my favorite fruit group, and I revel in the plentiful, reasonably-priced fresh berries that are available in the summer months. Last year I had a huge stash of blueberries and blackberries in my fridge and realized that I wasn't going to be able to use them all before an out of town trip. I put them all in a 2 gallon zipper freezer bag and spread them out as much as my freezer allowed, and they froze beautifully. I figured that I could bake with them in the cold winter months when berries are sparse, imported from miles and miles away, and expensive. But you know what? I was busy over the cool weather months with apples and citrus and didn't really use my frozen berries. So I was glad when I saw Dorie's Mixed Berry Cobbler on the list of recipes that I had not yet baked from Dorie Greenspan's book, Baking From My Home to Yours. It was the perfect time to use up some of that bounty from the freezer before this summer's berries were in full swing. - You can find the recipe on the original host blog, Sweet Life Kitchen. - I used the optional black pepper in the fruit mixture, and lots of lime zest. Taking a cue from some previous Dorie fruit recipes, I also added a pinch of ginger. - The topping is made with a biscuit method but it is then rolled out and applied like a pie crust. Because I used a deep baking dish rather than a pie pan but a deeper baking dish, I just tucked the circle of dough down on top of the berries. - I was worried about my topping because it wouldn't hold together; it was extremely dry and crumbly. I squished it together as best I could, put it in the oven and crossed my fingers. - The cobbler baked up golden on the outside and soft in the middle. The berries had just the right amount of juiciness. I served this just from the oven to my book group. This dessert was a runaway hit with the group members. The warm soft center of the biscuit topping was almost creamy, and combined perfectly with the berries and a bit of cold whipped cream. One of my testers said, "This is a recipe I have GOT to have!" and she was very pleased to hear that it was a Dorie recipe, since she owns the book. My only quibble is that the topping-to-berries was too high. Next time I make this, I will use more berries.